Two weeks ago, in reporting on the New Zealand Post Book Awards, I admitted that I had not read any of the three books that were finalists in the poetry section. One of the three, Dinah Hawken’s The Leaf-Ride, was published by Victoria University Press. 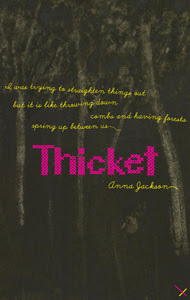 The other two, Rhian Gallagher’s Shift and Anna Jackson’s Thicket, were both published by Auckland University Press. In the event, it was Shift that won the award. I have one bad habit to which I revert whenever I read a sequence of connected poems. I can’t help trying to reconstruct the human story that lies behind them. I know this is not considered a very sophisticated thing to do. Poems should be read one-by-one for their sounds, their imagery, their structure, their word-play, their use of allusion, their emotional and intellectual impact. More recent and sophisticated scholars insist that we throw away any notion of Shakespeare’s sonnets having a linking narrative thread. Yes, a coherent sequence of emotional events may have been their genesis, but there is no way that we can reconstruct it now. We should appreciate them sonnet by individual sonnet. Rhian Gallagher’s collection Shift, which won the poetry prize in this year’s New Zealand Post Book Awards, is divided into three sections. Any collection that is divided into three sections immediately makes me ask “Why?”. And as so many of the poems in Shift are confessional and clearly carry a very personal emotional import, I find myself constructing a linear narrative out of them. So here goes in my (doubtless simplistic) reading of this volume. The first third of the collection is called “Shift” and ends with a poem of that name. I am wise to the multiplicity of meanings that the word “shift” has, but the most consistent meaning here is the shift in perspective from being a child to being an adult traveller of the wider world. Most of the poems in this section are poems of childhood perception, where things are sharply observed and invested with mystery - a stand of pine-trees; a wash-house; a dusty window; or a visit to dad’s job in the freezing works, with vivid material detail and a sense of the child’s smallness. Gallagher’s birth family are apparently Irish Catholic working-class who settled in New Zealand. In the poem House, she tells us of her father “stooped/among rows of potatoes,/the ghost of a famine chiding him.” There seems to have been a pietistic family reaction to the death of an infant sister of the poet – the infant being idolised as the epitome of purity in a way that the little girl (who later became the poet) could not keep up with. Yet late in this first section, the little girl has become an adult, travelling abroad (soggy England; Venice; European frontiers) but still thinking of home, as when, in the poem Shared Ownership Flat, “the ever malleable, mobile London cloud/ that tells me I am on an island” is an implicit reminder of other islands. The final poem in the first section, Shift is a poem about leaving London and hence making a literal shift; but it is also the shift of perspective where “the South Island/ Couldn’t be more far” and “Could this become my one at home/ among the clouds, the amazing clouds.” Here is someone no longer a child and yet once again small in the huge cosmopolitan world. In one sense then, this first section affirms the condition of being a New Zealander. The second section is called “Butterfly”, again a word with a multiplicity of connotations (a short-lived beautiful creature? butterfly-kissing? a social butterfly?). It appears to be the record of a lesbian love affair with an American. She is met in a bookshop in Charing Cross (the poem Lunch Hour). She is celebrated in the villanelle Butterfly. The scene shifts to Italy and to New York. Sometimes there is sexualised imagery as in “the tongue and trench of waves” in the poem Becoming. But, it would appear, after a period of mutual intoxication, the affair doesn’t last. The poem Between declares “Close in and distant, you had me./ Whichever way you moved/ I was swept, arrested.” The phrase “you had me” implies deception, and hence disillusionment. The affair is over. So the later poems in the second section steer back to solitary reflections on nature as, in the poem Lagoon where “this summer/ with its uncompanioned course/ steers me in”. And where does this all take the poet? Back to New Zealand. The third and final section is called “Shore”, and has the poet standing, in the volume’s best poem Shore, on a South Island beach “margin of every elsewhere here” – that is, again apparently on the periphery of things in relation to the wide world. The poems in this third section have the poet readjusting to New Zealand landscape and New Zealand mores. She has – if I read it aright – been summoned back in part by a family funeral. She encounters varieties of New Zealand manhood – taciturn male family members who hold their feeling in, and who contrast with a gay couple who hug people in farewell. In the poem The Powerhouse she recalls her father’s work from a more adult perspective. “I thought nothing would come if I hung around in these parts too long” she says in Shore. And maybe that is what New Zealand always will be to a traveller. A shore. A place to jump off from. So that is the linear narrative I wring out of this volume – from child’s perspective of New Zealand to escape into the wider world (capped with a love affair) to return to New Zealand and a lingering wanderlust. Stop mentally throwing things at me, please. I am fully aware that this narrative approach is reductive and without nuance and very presumptuous on my part. I am also aware that I have committed the cardinal sin of identifying the poet with the voice in which the poems are written. There is a difference, of course. But I excuse myself by repeating that the tone is very confessional. It is hard to read these poems as anything other than genuinely first-person. None of which passes any sort of evaluative comment on them. So I make my comments now. First, I always have difficulty relating to poems about love affairs. This emphatically has nothing to do with the fact that the love affair in this volume is lesbian. (I feel the same way in reading George Meredith’s Modern Love). The transient love affair simply isn’t part of my life. I miss the element of commitment, without which I see no love. Pardon me if this sounds like a moral comment, but there you have it. Second, I do appreciate Gallagher’s musicality, breaking forth in lines like “creaking like steps on stairs in depths of night” as she describes wind-shifted boughs in Under the Pines. Or , in the poem Shore, the great line on “un-resting Alps/ avalanching to the braided rivers”. She writes vividly. She has a sense of sound. This is a real poet. It is not as if Anna Jackson’s Thicket is a complete contrast with Rhian Gallagher’s Shift. Again, here is a woman who can go confessional and who sometimes speaks of personal and intimate matters. But the perspective is considerably different. Jackson is more overtly intellectual; more given to literary allusion; as often concerned with classical ideas as with personal feelings. Also Thicket is not divided thematically into sections. It is a book of “individual poems” rather than a concept album. I cannot even guess at a linear narrative here, but I can see some fairly constant concerns of the poet’s. The first two (brief) poems Watch This and Marry in Haste seem to be the protest of somebody who is not married and doesn’t want the domestic responsibilities marriage entails. But there follow poems which deal with themes of family-oriented domesticity. Planning a house. Playing badminton. Worries about dreams (Virgil at Bedtime; Dream Golems) and watching DVDs with the kids; and the perspectives of mothers and daughters (two poems inspired by Little Red Riding Hood). The Fish and I and Hansel in the House also reference fairy-tales. Doubling Back may end in metaphysics but it starts in supermarket shopping. These are all in their various way poems grounded in a home. The setting is definitely refined middle-class. In It Was an Honour John, when an old friend (or lover?) comes along, the table “looks like a picture, a magazine spread./ We uncork the wine, break the bread…” And we talk literary talk. Wine persists in Margo or Margaux. And then there is the academic life, with allusions to marking examinations and wondering about being a society hostess in old London. Three poems reference the Aeneid. So these are well-bred and civilised poems, rawness rubbed out and gamesmanship often in charge. Jackson’s overtly cerebrotonic tone speaks to the mind amusingly but, for my taste, a little coldly and self-consciously. Her attempts at pithy aphoristic style do not work for me and seem gnomic without gnosis. A poem like Speaking as One of the Billiard Balls strikes me as a non-euphonious concept poem - that is, the idea is all, comparing ricocheting billiard balls to pagan gods and the work of fate upon us. Unknown Unknowns pushes abstraction further, with reflections on the nature of the created universe; and For Some Reason works on the Russian doll (or Frankenstein) idea of creation within creation. I am not suggesting Jackson has no music in her. In The Coming On of a Maths Brain she counts her syllables carefully according to a new plan. It Was an Honour John is filled with concealed mid-verse rhymes. There is an awareness of metre and sound, though ‘tis often in abeyance. Nor am I suggesting that there is nothing heartfelt here. I can relate to Margo or Margaux’s “Let’s just keep driving to/ somewhere we haven’t looked up/ on the map, some town without/ any relatives to pin your features down to their’s” even if her aim is a romantic tryst. But between idea and sound, idea wins; and between head and heart, head wins. This is not a judgment. It is a categorization. Were I one of this year’s NZ Post Book Award judges, I would have had a hard time choosing between these two volumes. This is one of those odd habits I have, which is esteemed eccentricity. Sometimes, for the pure pleasure of it, I go back and read works that are classified as classics, but that on the whole are now read only by academics and unwilling students. Something in the solidity and durability of them appeals to me, though I always find that reading a classic also provokes a couple of questions – Why was this work regarded as a classic? And does it deserve the regard? 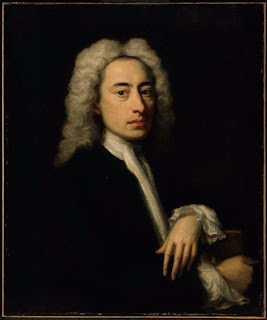 A couple of Saturdays ago, I set aside two or three hours and a bottle of good red wine, and read my way through Alexander Pope’s Essay on Man. I hadn’t visited it since I was an undergraduate. To dispose of the historical details which you probably already know – this is a set of four “epistles” which Pope at first had published anonymously before he admitted to his authorship in 1735. They were intended to be part of a much longer work surveying the whole field of ethics – a sort of metrical moral encyclopaedia – but the four completed epistles were as far as Pope got. Pope’s essential mission was theodicy. He was explaining and justifying the ways of God to Man. Although Pope vigorously denied it, most people noted how much the poem’s philosophy followed Leibniz. (Pope said he was more influenced by English wits like Bolingbroke and Shaftesbury). The Essay on Man was a huge hit, as much on continental Europe as in Britain. Kant knew sections of it by heart. Rousseau was fond of it. Voltaire read it in English, admired it and arranged a French translation although (famously) he later rejected its whole underlying “optimistic” philosophy and penned both Candide and his poem on the Lisbon earthquake to express his new quietist pessimism. He did not think God’s ways could be justified and retreated into a much harder Deism than Pope’s, which saw God as little more than a “first cause”. And here I must remark something that has bugged me in a few recent commentaries. Alexander Pope was formally a Catholic, but you would be hard put to prove that the Essay on Man is specifically Christian. The God it presents is very much a philosopher’s God, with no mention of any special redemption for humanity. God is a kind of king directing natural forces and never identifying with his creation. Yet I now find commentaries, written by the theologically illiterate, which assume that simply because God is seen as ultimately benign, then the assumptions of the poem must be Christian ones. That is, quite simply, wrong. Which sounds like a more elegant way of saying that Pope conducted his education in public and over-reached himself. And that, really, is as much as I want to say about the poem’s background and philosophy. After all, as an Augustan work, it is very much the poetry of direct statement. To follow its “argument” it is sufficient to read it, so I’ll leave it to compilers of books for undergraduates to say what it means. My purpose in reading the Essay on Man was to see how good it was as poetry. And here a big barrier presents itself. Like Hamlet, the poem is “full of quotations”. I am reminded that Alexander Pope is the third-most-quoted writer in the Oxford Dictionary of Quotations, after Shakespeare and Tennyson. Sometimes, Pope’s phrases have passed into popular use while their source has been forgotten, to the point where some of his choicest items are now routinely misquoted. (“A little learning is a dangerous thing”, from his Essay on Criticism, is now almost universally misquoted as “a little knowledge is a dangerous thing”). I recall the last twelve of these eighteen lines being quoted by F.L.Lucas in his venerable study Tragedy (1927) when he wished to expound on the tragic nature of man, caught between strength and weakness, will and subjection. So I’ve set the scene of the poem’s historical context and I’ve noted the bits that are as familiar as household words. But I’m still left with the problem, how good is it as poetry? The same, my lord, if Tully's or your own. In the end, then, when I have noted the felicities of Pope, the nature of his philosophy, his poise and the skill of his balanced statements, I find the Essay on Man killed stone-dead by its didacticism. There is little resonance, because we are told overtly what to think, with little wriggle-room for the imagination. Only when Pope’s figurative language runs ahead of his didacticism, as in some of the passages quoted above, does the poetry take flight. Then, so far unaddressed by me, there is the maddening jog-trot of the heroic (iambic pentameter) rhyming couplet. I am aware that different literary cultures react differently to rhyme. The great French tragedies (Corneille, Racine) are written in rhyming couplets, which are totally alien to the English-language sense of tragic solemnity but which seem to work handsomely for the French. Doubtless rhyming couplets struck Pope and his contemporaries differently from the way they strike us. I have long been aware of the later sharp criticisms of this Augustan style. There was Keats in Sleep and Poetry (itself written in a different sort of rhyming couplet) telling us of poets like Pope that “with a puling infant’s force/ They sway’d about upon a rocking horse/ and thought it Pegasus”. As famously there was Matthew Arnold in his A Study of Poetry in 1880 saying that “Though they may write in verse, though they may in a certain sense be masters of the art of versification, Dryden and Pope are not classics of our poetry, they are classics of our prose.” This is a way of telling us that Pope’s poetry isn’t poetry at all. I don’t go along with this entirely – it is the reaction of Romantics and Victorians against a form of poetry different from their own. But after reading the Essay on Man in one reflective three-hour afternoon sitting, I found the jog-trot of rhyming couplets had invaded my brain and for hours afterwards I was infected with nonsense couplets, sometimes with meaningless real rhymes attached to them. Yes, Pope does move his caesura around and he’s not as mechanical as all that. He is a great wit and sometimes a master of pithy wisdom. But the very form comes to seem complacent, end-stopping reality, drawing a firm line around it and insisting that these precepts are the only possible way of interpreting truth. One is ultimately hammered and stunned by the Essay on Man rather than enlightened. At his worst Alexander Pope becomes the Martin Tupper of intellectuals. I’m glad I have not been accosted by this term very often recently. It became too much of a cliché to be used by thinking people. But when it reigned it was a tyrant. The context was usually an argument, disagreement or discussion over employment, the value of academic degrees, political ideals, the economy or religious beliefs. The question was thrown out as a challenge, suggesting that whoever had just spoken was unrealistically idealistic, detached from the hard facts of money, a fantasist, or somehow evading obvious truths. It found its way sometimes into the soi-disant lucubrations of editorialists and columnists. Now there are times when fantasy has to be challenged, when people have to see how much society depends on economic structures, and when idealists have to be (metaphorically) shaken by the throat. Like a fist in the face, the phrase “the real world” could sometimes serve a real purpose. But nine times out of ten, alas, it was a signal that the questioner was not doing any thinking. I am not going to go all Platonic (or Buddhist) upon the question of reality, and ask whether we can really know what reality is (though that is a good question). Nor am I going to do the postmodernist rain dance of claiming that there is no reality – only ten billion individual perceptions and therefore nothing objective. Allow me, for the purposes of argument, to beg a whole lot of questions and assume that there really is an objective and measurable reality. Given this, I have always found the aggressive use of the phrase “The Real World” to be a problem. Which part of “The Real World” am I being asked to join? The real world of parents trying to do the best by their children? The real world of the research scientist with her flashes of insight built on solid study, experiment and research? The real world of the artist working on inspiration, talent and the materials at hand? The real world of the lawyer or police officer having to deal with variable human material and enforceable laws? The real world of the philosopher or theologian grappling with both abstract concepts and canonical texts? These real worlds do not cancel one another out and are simply matters of perception. They all exist. (I am not a postmodernist). But I don’t think I was ever challenged to join these parts of the objective and measurable real world. Instead, whenever I heard the aggressive question “Why don’t you join the real world?”, I knew I was being given a reductionist concept of reality. For whoever used the term “the real world” meant some pragmatic concept of trusting nobody, assuming that nobody was concerned in anything other than self-interest and a profit, seeing life as a struggle with winners and losers, and disregarding any moral obligation to care for others. “The Real World” was, in fine, reality as conceived by neo-liberal marketeers. Joining the real world meant ignoring ideals, finer feelings, social obligations and morality in order to pursue profit. After all, assumed the aggressive questioner, everybody else is doing just that. So get real. Join the real world. I admit this conception is part of the real world. But it is not the whole of the real world any more than sexual desire is the whole of love. I have learnt to resist rhetorical appeals to “the real world”. Partly because I know I am in the real world and such appeals are appeals to a very limited part of it. To begin this painful review, let me state unequivocally some things I believe. I believe that if somebody is convicted of a crime and has served out a sentence, that person has the right to live a life unmolested by journalists who want to keep revisiting the crime. A grown and law-abiding woman, now in her seventies, who has “paid her debt to society”, should not be pilloried endlessly for a crime she committed when she was a teenager, no matter how horrendous that crime may have been. I further believe that if that woman, after serving time, goes on to live a productive and crime-free life, then it should be a matter for rejoicing, not for prurient speculation. Even if too often our prisons are not places of rehabilitation, isn’t that at least what they aspire to be? So far, I have said only what Joanne Drayton is ostensibly saying in The Search for Anne Perry. Unfortunately, while it condemns sensation-hungry journalists, The Search for Anne Perry is really a book which has its cake and eats it too. The Search for Anne Perry would never have been researched and written if the best-selling author Anne Perry had not, as a teenager, committed murder. Surely this fact was what encouraged Drayton to pursue the project in the first place. This is signalled by the book’s very title. Apart from being a commonplace title for books that claim to tell the “true story” of somebody, “The Search for…” also immediately suggests that there is some new and sensational thing yet to tell us. (There isn’t.) 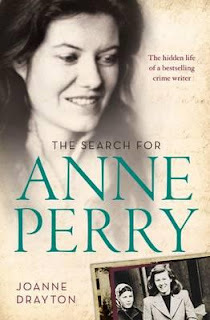 The front-cover blurb promises “The hidden life of a best-selling author” and includes the familiar photograph of the teenaged Juliet Hulme, before she became “Anne Perry”, leaving court with her partner in crime. The whole structure of this book is built around a piecemeal revelation of Anne Perry’s version of the crime. It is the centrepiece of the book. Joanne Drayton’s protestations to the contrary, then, this book does what those despised journalists have done. It titillates by welding the best-selling author with her unbalanced teenage self. And, to make matters worse, it fudges some of the detail concerning the crime and ends up being very much the “authorised” version of events as Anne Perry now wants them to be understood. A work of PR then, as well as of exploitation. Perhaps it is worth noting that Harper-Collins, the publishers of this book, are among Anne Perry’s publishers as well. A few basic facts if you need reminding of them. In 1954, when she was 15, Juliet Hulme, member of one of Christchurch’s most respected families, helped her 16-year-old friend Pauline Rieper (Parker) to murder Pauline’s mother by smashing the woman’s head in with a brick. Being a case of matricide, the crime caused a sensation in the press, especially as there were hints of a lesbian relationship between the two girls. They were convicted and imprisoned (separately) for about five years each – a remarkably lenient sentence by today’s standards. When they were released, each disappeared into obscurity under a new and assumed name. Literally dozens of sensational articles were written about the case, as well as a couple of (now forgotten) novels, a play and a number of books – including Glamuzina’s and Laurie’s tendentious and often inaccurate Parker and Hulme – A Lesbian View in 1991. But it wasn’t until 1994, when Peter Jackson’s and Fran Walsh’s movie on the case Heavenly Creatures was released, that journalists at last set about tracking down and “outing” the two grown women who had once been murderous teenagers. Only then did it become public knowledge that Juliet Hulme was now Anne Perry, best-selling author of Victorian-era thrillers and detective stories, living a single and unshared life in Scotland. Last year there appeared Peter Graham’s So Brilliantly Clever, subtitled Parker, Hulme and the Murder That Shocked the World. Despite the sensational subtitle, my review (Sunday Star-Times 16 October 2011) judged it to be a scrupulous, methodical and well-researched account of the murder, and I ventured to suggest it “could well be definitive”. It was deservedly a finalist in this year’s New Zealand Post Book Awards. Joanne Drayton began her research and writing before Graham’s book appeared. However Graham’s book is listed in her bibliography, and has presumably been consulted. But it is never mentioned or engaged with in Drayton’s text – perhaps because in some important details it contradicts the version that Anne Perry has told to Joanne Drayton, and that Joanne Drayton has accepted uncritically. The Search for Anne Perry then proceeds to tell us about the sustaining power of Anne Perry’s Mormon faith and sets about analysing Perry’s books and literary career. We are told of how she broke into writing, of her working methods and rising sales and publishers’ deals. Drayton accounts for every last dollar [or pound] in Perry’s literary contracts. But this is all a matter of suspense as we wait for Perry to be outed. Hence there are the references to Perry’s fear - inexplicable to her agent and associates - of small things that might put her name or photo in the press. Anne Perry has been a diligent and prolific writer. She has written one long series of detective novels with a hero called Pitt, and another series with a hero called Monk. She wrote a sequence set in the First World War, some fantasy novels and a few other historical novels. Nearly sixty of her titles are listed in the bibliography. She sure can churn ‘em out. As a reviewer, I have read a few of Perry’s thrillers (some before her original identity was known to me). They strike me as good middle-brow stuff, often shaky in their historical details, their characters usually caricatured and wafer-thin, but doing the formula business in terms of presenting a crime story and providing a reasonable solution to a mystery. However there is no way that they could be described as great, or even seriously adult, literature. I therefore find Joanne Drayton’s claims for them, and her pretensions to be writing a “literary biography”, more than a little overblown. “Make searching and powerful comments”? Really? I don’t believe any of Perry’s novels do any such thing. At best, their characters are sometimes vehicles for platitudes and for the type of judgements on Victorian morality that are now clichés . Patriarchy, sexual inequality etc. etc. may be condemned. But isn’t that what we now routinely expect in modern formula novels with period settings? Quite so. I am not at all surprised to find that Americans are her most avid readers, partly because her novels give a Hollywood version of foggy Victorian London and its mysteries. They play up to movie fantasies of Victorian life. I could add that the great majority of enthusiastic reviews of Perry’s work which Drayton quotes come from either second-rank reviewers or from the Publisher’s Weekly, which is essentially the house journal of the book trade and more concerned with a book’s sales prospects than its literary merits. Inevitably, this makes us think of the crime in Christchurch’s Victoria Park. Inevitably, too, it makes us consider the ironies of somebody who has committed murder now making her living writing about violent crime. But then there’s always the possibility that being known for having committed a murder could make an author’s murder mysteries more saleable. Only a little under halfway through The Search for Anne Perry [pg.148] does Drayton turn to the circumstances of the 1954 murder itself. Her technique is to cut back and forth between a narrative of 1954 and an account of Perry’s ongoing success as a novelist. This creates a very skewed perspective. Implicitly we are being asked to judge (benignly) the teenager who committed murder in terms of the grown woman assiduously pursuing her craft as a writer. Implicitly, we are invited to see negatively those people who made negative judgements on Juliet (and Pauline) at the time. I did not find anything about the 1954 murder in The Search for Anne Perry that I did not already know from Graham’s So Brilliantly Clever. Indeed, given that Drayton sticks so resolutely to Juliet-Anne’s perspective, I found considerably less. Graham gives much, much more than Drayton does on the context, the nature of the police enquiry, the various theories that have been offered, the social impact in New Zealand etc. At this point I almost choked. In So Brilliantly Clever [Pg. 20], Peter Graham asserts that Juliet’s mother Hilda was quick and astute enough to destroy Juliet’s diary and other of her writings before the police could see them. The inference is that Juliet’s diary would have been just as incriminating as Pauline’s. Graham provides no evidence for saying this but, given the girls’ overheated emotional relationship and their shared habit of writing copiously, I find Graham’s scenario convincing and plausible. As this is such a key detail in the story, and as Drayton tells us how often she interviewed Anne Perry, how can she possibly write “it is possible that Juliet kept a similar record”? Didn’t she think to ask her? Where Perry has volunteered information, this book very much takes her word for it – and after the best part of 60 years of recalibrating and adjusting and smoothing off her “memories”, Perry is probably not the most reliable witness. Drayton can say “It was a communion of minds and souls when Juliet and Pauline discovered each other in May 1952.” (Pg.155) She can comment “Now each could share the hormone-driven exhilaration of someone of like mind.” (pp.173-174) And yet she accepts Perry’s word when Perry says “There never ever was a sexual element to our friendship.” (Pg.251) We are told of Juliet-Anne’s remorse, when she was in prison, for what she had done [Drayton calls it an “epiphany”]. But this expression of teenage remorse (Pg.257) is sourced to interviews Perry gave nearly 50 years after the event. I can accept that life in Mt Eden Prison was grim in the 1950s and that it was wrong that young Juliet Hulme was never given any psychiatric counselling. Drayton is right to note these things in some detail. But, predictably, The Search for Anne Perry plays up the “moral panic” notion of the New Zealand in the 1950s to argue that reactions to the case were extreme and that therefore – by implication – the girls’ actions and characters were not as bad as they were interpreted. If you want to know the detail of the 1954 Parker-Hulme case, then Graham’s So Brilliantly Clever is a far better, more detailed and more comprehensive book than this. If, on the other hand, you want to believe that Anne Perry is a misunderstood literary giant, then The Search for Anne Perry is the book for you. I revert to my first opinion – the woman has a right to pursue her craft unmolested by intrusive journalists. But we as readers have a right not to be fed what amounts to a PR job in the guise of an investigation.